Take it from me, folks — Those are nine words that should never be spoken in the English – or French — language. I got a haircut that was so awful, my own husband didn’t recognize me when he picked me up at the airport when I got home. The shortest hair on my head — – my bangs – were about one-eighth of an inch long. I cried. I had to beg the stylist to blow my hair out, as his vision of me did not include electricity. I hated it. My only consolation was that I knew it would eventually grow out. Maybe, maybe by the time I became a Senior Citizen. Here I had entered the salon, hoping to look like Catherine Deneuve — and I wound up exiting looking like Gerard Depardieu. Now I say this for contrast as I just experienced what quite possibly is the best hair salon experience of my life. 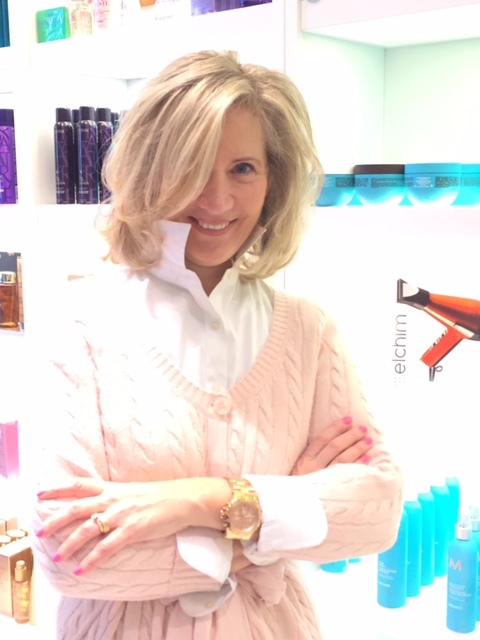 It was at Sassoon Salon Boston, and as I sit here afterwards writing this blog post about hair salons, I am utterly thrilled. My husband tells me I am a fox. And I actually have the pictures to prove it. I went in with dark roots, newly Keratined hair, and a desperate need for a cut. Assistant Creative Director Lena Vinnitsky met with me, and immediately asked me all of the right questions, in order to give me the cut that would complement my face. (I would show you the “Before” picture, but trust me — it’s too scary.) I felt immediately at ease, and that she “got” me and understood me – a perfect stranger. 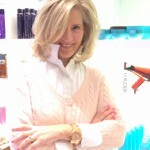 After that, Salon Director Talia Wildes consulted with me about my highlights. After speaking and telling her that I detest skunk-stripe roots, Talia decided to forget about darker lowlights and just give me a head full of buttery blonde highlights. Let’s face it – I was meant to be born blonde! It just fits my personality. My visit also included a Malibu treatment, which rids your hair of any mineral buildup, and clarifies your tresses. Afterwards, Spenser, who hails from Hawaii, gave me a soothing scalp massage/wash/conditioner pampering that oozed aloha. It was so relaxing that afterwards I was ready for my nap. Little did I know that I was almost ready for my close-up. Lena cut my hair, adding feathery fringe to the front, and luscious layers all around my head, assuring me that such a Sassoon cut would grow out beautifully. Let’s face it – that’s one of the things a Vidal Sassoon salon is famous for. I actually learned a lot about the Sassoon operations from speaking with Lena. “Our students do a better job than many professionals,” she told me, explaining that apprentices and students specialize in either cut or color – but not both. After getting a hairdressing license, students train for one to two years. One of Lena’s friends calls Sassoon “The Marines of Hair,” as the training is so rigorous and structured. That’s just one of the things that makes the Vidal Sassoon company so impressive. It’s real point of differentiation. After my precision cut, Lena blew-dry my hair from the bottom up, assuring me that it would add volume – and boy did it ever. I like to have Big Hair, as it flatters my rectangular face, and she joked that since I like my hair blonde and big, I must have had a past life in Texas. Well, faster than you can say “El Paso,” she gave me va-va-voom volume. “My favorite thing is transforming people – and external transformations propel the internal ones,” she said. Lena also advised me that I could get away with just blowdrying my hair without a brush at all, and then putting my hair in Velcro rollers. I love that time-saving, smart idea — It’s a really savvy travel tip. Talia sent me home with a goodie bag of Kerastase products, including a special “Fusio-Dose” home treatment designed to transform the appearance of your hair. And here’s the best part: She gave me special salon referral cards that give my friends a 25% discount plus a discount for me if they book at the salon. Even better, the salon is always looking for models, who will have their hair highlighted or cut by a student. It costs only $45 for a highlight, and $20 for a haircut – if you are willing to trust your hair to a student. I would do this in a heartbeat! If you are reading this, call the salon RIGHT NOW at 617-536-5496 and tell them you would like to model on Mondays’ “training nights.” You’ll save a fortune while you look fabulous. So I’m all set for my next globetrotting trip – I sail away to Europe in about 10 days, and I can assure you, I will have a head of gorgeous blonde hair that every French woman – and every European – will envy. Oo la la! And Catherine Deneuve — consider yourself warned!